(Trent Nelson | The Salt Lake Tribune) The site of the Bear River Massacre in Franklin County, Idaho, Tuesday, August 9, 2016. At the site of the Bear River Massacre, in a grassy valley of southern Idaho, there’s a small monument made of stone that sits on the side of the highway. That’s a skewed version of what actually happened. And now that the Northwestern Band of the Shoshone Nation has signed a contract to buy the burial grounds, the tribe is looking to correct the record and memorialize the sacred site. “Our perspective has never been heard,” said Darren Parry, the band’s chairman. 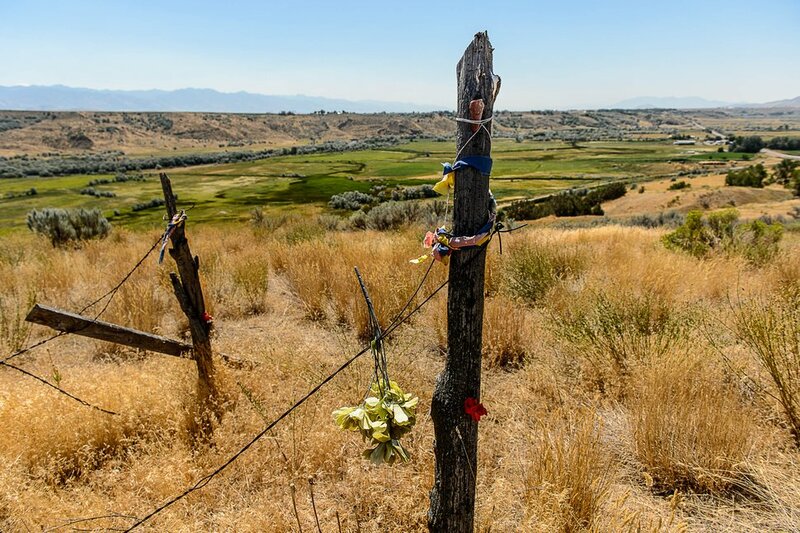 (Brian Maffly | The Salt Lake Tribune) Darren Parry, chairman of the Northwestern Band of the Shoshone Nation, is leading efforts to commemorate the site of the 1863 Bear River Massacre outside Preston, Idaho. 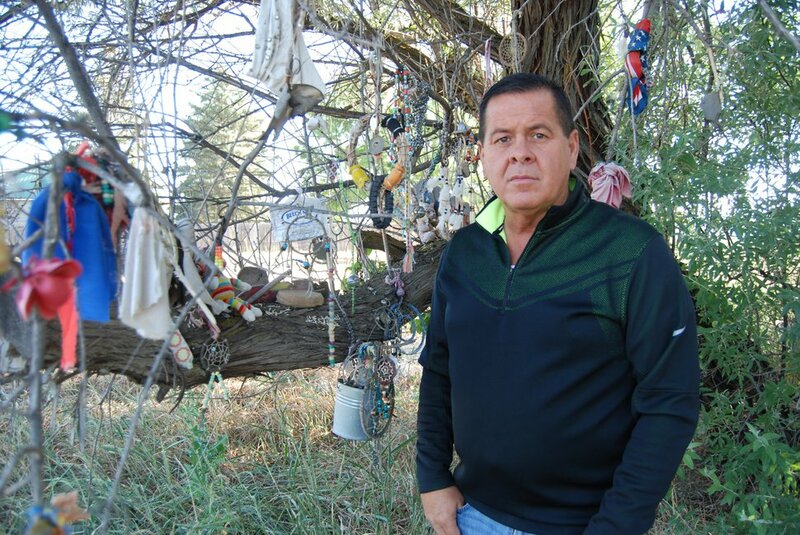 He is pictured here beside a tree on U.S. Highway 91 where people have hung offerings to honor Native Americans who died in what is believed to be the deadliest attack by U.S. soldiers during the West's wars. The tribe will pay $1.8 million for roughly 650 acres along the Bear River near Preston, Idaho, that surrounds 35 acres it already owns. Ralph Johnson, who sold his family’s farm land, declined to comment on the Sept. 29 transaction. The deal is expected to close in the coming months. It’s been nearly 155 years since the historically classified massacre occurred, though the outdated memorial, erected by the Daughters of the Utah Pioneers in 1932, still refers to it as “The Battle of Bear River.” The plaque, too, mostly expresses sympathy for the 14 U.S. Army volunteers who died in the assault, despite records that they led the dawn attack on Jan. 29, 1863 with the intent of punishing American Indians for interfering with mining supply wagons. The militia killed hundreds of Shoshones — estimates range from 250 to 500 — and beat children and raped women. It is considered one of the deadliest massacres of American Indians in U.S. history. The monument also claims that Chief Sagwitch was among those “reported killed.” He actually fled to the river and later led survivors to join The Church of Jesus Christ of Latter-day Saints. His late granddaughter, Mae Timbimboo Parry, lobbied for decades to secure the massacre site for the tribe. She often told Darren Parry, her grandson (and Sagwitch’s great-great-great-grandson), when he was a kid that one day he’d have to take up the fight to reclaim the land. The funds to buy the parcels came from two technology businesses operated by the tribe, as well as a $72,000 grant from the National Park Service awarded in August to preserve the site. Parry intends to develop visitor centers to help tourists better understand the massacre and properly honor the dead who were never buried. “They’re still there,” he said. 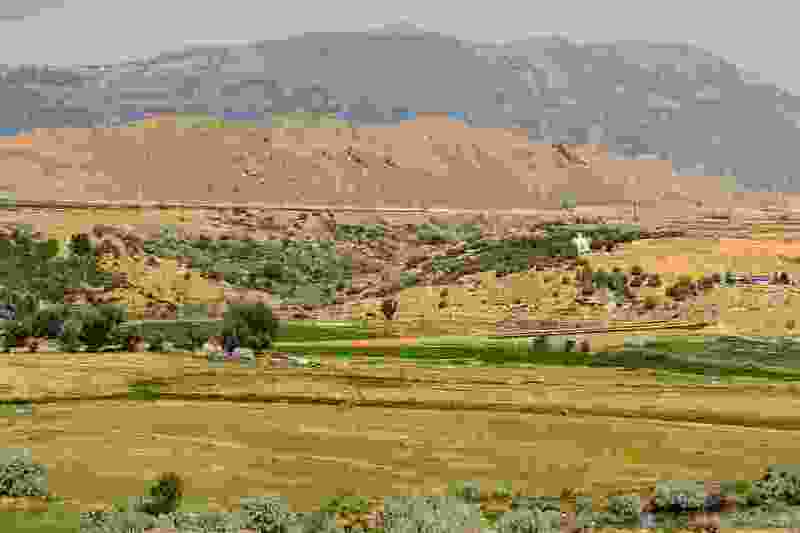 He also hopes to restore the landscape to what it would have been like in 1863 through a partnership with Utah State University, which has done extensive field work in the area. That will require digging out thick patches of nonnative Russian olive trees and reintroducing more willows. (Rick Egan | Tribune file photo) Helen Timbimboo and Leland Pubigee, at the monument for the Bear River Massacre, near Preston Idaho in 2008. 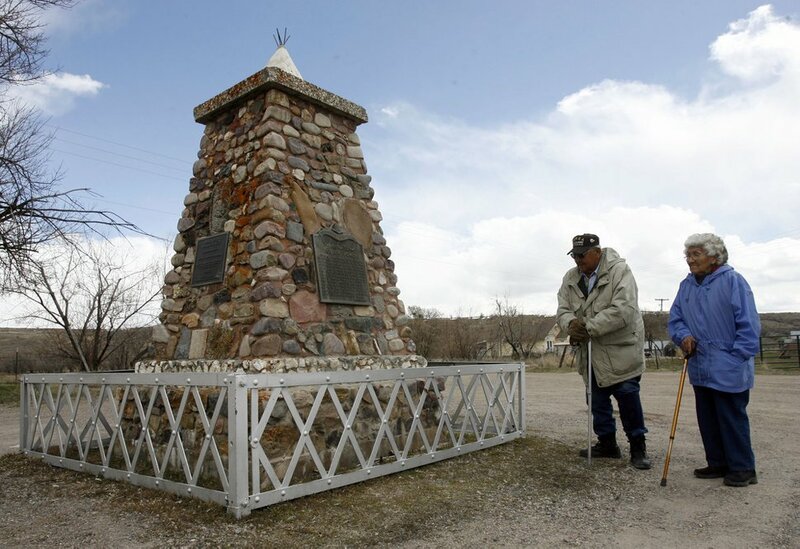 The tribe has no plans to disassemble the marker put up by Daughters of the Utah Pioneers, which did not return requests for comment, but Parry hopes the group will consider revising its plaque. She has spent the past 15 years buying Shoshone artifacts at auctions, including a grinding stone, a spearhead and a pair of moccasins. Purchasing the land, Timbimboo-Madsen suggests, is just another place where American Indians are paying for something that once belonged to them. “The only way that our children can see them, can touch them or know about them, seems like we have to buy them to bring them back this way,” she added. The tribe has previously bought about 180 acres near Washakie, a town the LDS Church established in Box Elder County, which includes the cemetery where Sagwitch was laid to rest. There is another 50 acres, owned by two different families, that Parry would like to acquire at the massacre site. The Northwestern Band of the Shoshone Nation would gather there around the Bear River’s hot springs each year for the Warm Dance. The ritual was meant to summon spring. The tribe had celebrated the event in the weeks before the 1863 attack and hasn’t since. Now that it owns the land, Parry hopes his people will gather once again to stomp down the snow, rekindling a lost tradition.